Undersong (2002-2008) is a cycle of chamber compositions that are performed consecutively, without pause, to form a CD-length supercomposition. The title refers to the powerful and unyielding voice of the oppressed as well as the lyrical strands of interconnection that lie beneath the work's fragmented surface. Composer Jason Eckardt is one of a small but growing number of composers adopting the aesthetic viewpoint of “Second Modernity.” Briefly described, this approach involves a renewed embrace of abundant virtuosity, compositional and conceptual rigor, and dedicated exploration of new playing techniques and interdisciplinary applications in contemporary music. All of this may sound like a very intellectual approach to an artistic discipline. But Eckardt’s music is anything but sterile. Instead, it is kinetic and vigorous, as inspired by the enthusiasm for heavy metal with which he began his musical journey as it is by the top notch players who now champion his work. 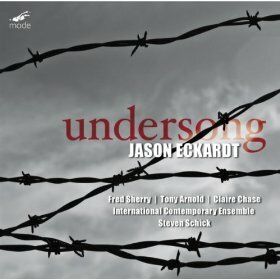 Indeed, one couldn’t ask for better advocates in this repertory than the ones appearing on Undersong, Eckardt’s latest release Mode release. This group of pieces, based on Laura Mullen’s text of the same name, is thematically unified by the concepts of decrying oppression, corruption, and dispossession. Its cornerstone work The Distance features Mullen’s words sung by soprano Tony Arnold, who negotiates its high tessitura, extensive chromaticism, and angular melismas with a graceful fluidity that few other vocalists can muster in such challenging fare. Simply put, she’s a rock star in this genre. Her accompanists – stars in their own right – are members of the International Contemporary Ensemble, conducted by Steven Schick. Their performance exudes a confidence that belies the myriad challenges that they face when realizing Eckardt’s score. ICE flutist Claire Chase is also featured in two other works on the disc. “16″ references the sixteen regrettable words in G.W. Bush’s 2003 State of the Union address (those about WMD in Iraq): words that helped to later cause so many recriminations and, worse yet, casualties. Parlando techniques, breathy attacks, and stuttered mouth sounds turn the flute into a metaphorical mouthpiece for troubled communication. It is accompanied by percussive attacks and furtive gestures from a string trio. Chase’ playing bridges the gap between these deliberately halting sounding effects and fetching, albeit fleeting, snatches of melody, as if yearning for an eloquence that, in this score, is deliberately avoided. Meanwhile, on Aperture, Chase is part of a Pierrot ensemble in a work that indulges both the noise and effects end of the sound spectrum as well as more pitch focused passages. Sustained single lines are pitted against pointillist excursions and busily angular sections. The whole creates a diverse, labyrinthine compositional architecture, full of twists and turns and engaging surprises. Cellist Fred Sherry performs the glissando-filled and devilishly tricky solo A Way (Tracing) with characteristic flair, attacking its quickly evolving formal terrain with mercurial suavity. Undersong is a mind-blowing and aesthetics-expanding journey. Recommended. Fiercely engaged and stoical music from a former jazz and Metal guitarist whose work confronts what he calls the “human travesty” of political malfeasance validated by public indifference. 16 for amplified flute and string trio refers to the 16-word lie embedded in Dubya’s State of the Union address to justify the war in Iraq: Saddam’s uranium objectified as moonshine. Eckardt’s Metal past comes out in the solo cello piece A way [tracing] for Fred Sherry, which combines boggling complexity of metre and intonation with bludgeoning directness. Aperture plays with volume and weight, reversing the ppppp ending of 16 with heavy bow-weight and doughty attacks. Eckardt acknowledges poet Laura Mullen throughout. They met at the MacDowell Colony and discovered a shared understanding of how art could still speak to/for the dispossessed. She takes credit for most of the titles and for the text to The Distance (This) which completes the cycle. I’ve listened to enough of Eckardt’s music to expect the uncompromising. This, though, has a new and positive confidence. "As an artist angered and ashamed by my country's actions, my deepest response is expressed in my work and my faith in art's ability to contribute to – if not transform – society," writes 41-year old composer (and former jazz and rock guitarist) Jason Eckardt. Noble sentiment indeed, but the people out there who actually transform society – the businessmen, bankers and politicians – are too busy making money or trying to get poor people to pay for their mistakes to listen to seriously well-wrought contemporary classical music such as this. Or find time for any culture whatsoever, I suspect, unless you happen to believe the amusing stories of French President Nicolas Sarkozy's recent "crash course" in cinema – presumably his wife's idea – watching (so we're told) three Hitchcock films a day, while jetting around Europe trying to solve the Eurozone debt crisis. Yeah man, pull the other one. Undersong is a sequence of four compositions written between 2002 and 2008 orbiting that year's setting for soprano (Tony Arnold, exemplary) and 10 instruments of The Distance (This), an ambitious poem in six sections by Laura Mullen, whom Eckardt met and befriended while they were both in residence at the MacDowell Colony back in 2002. At the time he was at work on what became the second piece in the set, 16, for amplified flute and string trio, but subsequently added A Way (tracing) for solo cello in 2006 and Aperture, for flute, clarinet, violin, viola, cello and piano in 2007. Though on first listen you're likely to file this one away on the New Complexity shelf along with Ferneyhough, Barrett and Dillon, there's a sensitivity to pitch here that reaches further back in time to Webern (apparently the déclic which led Eckardt to put down his guitar and pick up his pen) and a feel for word setting worthy of Elliott Carter. In fact, I'd say The Distance (This) is right up there with Carter's A Mirror On Which To Dwell, myself. Elsewhere, the performance by cellist Fred Sherry – another grand homme of American music – of A Way (tracing) is stunning, and flautist Claire Chase's navigation of the vocal complexities of 16 truly heroic. The title, the composer informs us, "refers to the sixteen words that should have been excised from George Bush's January 2003 State of the Union address: 'The British government has learned that Saddam Hussein recently sought significant quantities of uranium from Africa.'" Well, Saddam is no more, and with a bit of luck we won't be hearing much more from Dubya or his English poodle Blair either, but I expect to be listening to this fine music for years to come. Alas, I doubt it will ever change the world at large, but it'll make mine a better place, and that's a start. La biografia ufficiale di Eckardt (1971) afferma che e stato l’ascolto di Webern a fargli posare la chitarra che suonava in gruppi jazz e metal a favore della penna da compositore. Una tipica storia Americana di cui possiamo considerare gli effetti in “Undersong”, u ciclo non-ciclo di Quattro composizioni ideate tra il 2003 e il 2008: AWay [Tracing] (cello solo), 16 (flauto amplificato e trio d’archi), Aperture (flauto, clarinetto, archi e piano) e The Distance [This] (voce soprano e dieci strumenti). La ricerca sonora di Eckardt è mossa da un’urgenza legata a quanto non va nella società contemporanea in tema di libertà individuali e diritti dell’uomo. Per l’autore fare musica significa quindi corrodere la norme che ci sono imposte. Dire che la questione si rifletta con evidenza nei suoi brani è ovviamente un’eresia. Si apprezza però, attraverso il rigore e la geometria di suoni asciutti e non pretestuosi, il senso di una creazione che sottende altro e di ciò si nutre per salire in superficie. Esecuzione di alta qualità, affidata al violoncello di Fred Sherry e all’International Contemporary Ensemble.